There once was a PhD student – let’s call her Phyllis- working hard to land her research career. For that, she had to write a dissertation containing at least four studies. Her evil brain wanted her to not only conduct empirical studies, but also do a systematic literature review. At first, Phillis tried to find reasons for not doing it, because she dreaded that whole process. However, after a while she saw the greatness of the idea and took off to face the adventure. This adventure would not be a real adventure, had she not gotten into trouble several times. Her first three problems (selecting search terms, the searching itself, and selecting articles), she got through rather easily thanks to Indira’s blogpost about doing a systematic review. 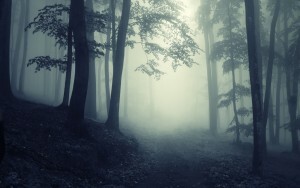 But then, real horror came upon her: she had to make her way through the dark forest full of relevant articles… To get started she decided to hack and slash a path through the articles in order to be able to get a better view on the really relevant articles. She cut down 21 articles, meaning ‘only’ 82 were left out of the initial 103. This rough way of cutting out those 21 articles was done by means of scanning. Phyllis scanned all the full texts: just on lay-out and (sub)headings. This scanning showed that the 21 articles were no empirical articles, although the abstract might have given her that idea. Now the dark forest was a little lighter, although still pretty scary. So, Phyllis made a plan for her next move. She stocked up on a coding scheme and other work and started working on her 9-week plan: From Monday through Friday, she would read 2 articles each morning and work on one of her other studies in the afternoon. For, as she knew, in the mornings she would be most clear-minded in order to focus on the articles. She gave herself 1,5 hour per article with 30-minute break in between. The first few days went perfectly, exactly as planned. But then, another horror appeared: a wrongly selected article! So, she thought she had a nice, solid base of 82 articles, and now she would probably have to cut more out! It was very important for her now to believe that everything would still turn out fine. “It will probably only help the other articles – the correctly selected ones – to get a better spot, to grow more,” she told herself. 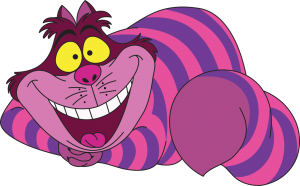 But then, right after she was finally back in her flow, the Cheshire Cat appeared and started asking questions: “Why are you throwing some articles out? How will you write this up in your paper? What are the reasons the other articles get to stay?” Phyllis sighed, though realizing the Cheshire Cat had made some pretty valid points. So, she decided to mark the articles she would throw out. She would write one or two sentences in red ink, explaining why the article did not fit her review. Generally, there were two reasons: Upon reading the full text, the article did not agree with all the inclusion criterial; or the article did not provide data for the ‘results’ columns in her coding scheme. The Cheshire Cat seemed happy for now, and disappeared again. Phyllis, being a bit delayed by now, moved on with her not-9-weeks-anymore-plan. When the end of the dark forest of articles came, she realized that also the National Carnival was very close. She had intended to show people her work on her review at that Carnival, and although she had gotten very far, she hadn’t written a word about the review, yet. At that exact moment, the Cheshire Cat appeared again. And, as this mystical creature is known to do, he started asking questions again: “What do you think would be a good idea now? What are your exact intentions for your presentation at the Carnival? How can you make sure you get at that point?” After a brief discussion of these questions and Phyllis’ answers, the Cheshire Cat disappeared and Phyllis was by herself again. As a result from her second run-in with the Cheshire Cat, her plan got adjusted; Phyllis decided that the articles she had reviewed thoroughly by now provided a nice base upon which she could write a first draft of her review paper. Along the writing, she would keep on reading in order to complete the reading process and supplement the already written results with new data. The beauty of this new plan, was that there was not only a path through the forest of articles – which by now was a lot lighter – there were directions too on how to walk it. At the moment, Phyllis is finishing the path, but thanks to the first part in combination with the directions, she has a better feeling of where to go next and how to do it. And in case the Cheshire Cat appears again, she already has some answers prepared, for the first two appearances from that philosophical creature made her keep track of all her decisions. 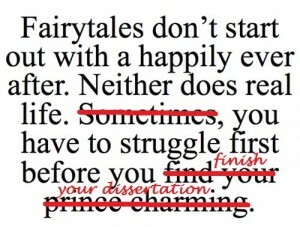 Although Phyllis is still working on her review and her dissertation, I feel confident to close this story by stating: and her dissertation will be finished, giving her a happily ever after.